Location: County Donegal, Northern Ireland. 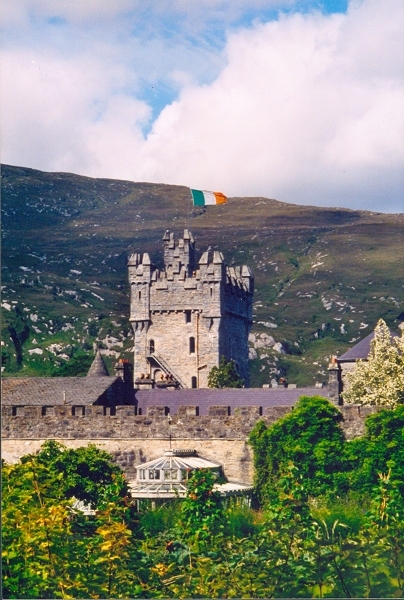 Notes: Glenveagh Castle is a large castellated Mansion house built in the Scottish Baronial style within Glenveagh National Park, near both Churchill and Gweedore in County Donegal, Ireland. The castle was built between 1870 and 1873 and consists of a four storey rectangular keep surrounded by a garden, and has a backdrop of some 165.4 km² (40,873 acres) of mountains, lakes, glens and woods complete with a herd of red deer. The Visitor Centre has displays that explain the park as well as an audio-visual show and is accessible for visitors with disabilities. The gardens and castle were left to the Irish nation in 1981 by Henry Plumer McIlhenny of Philadelphia, who had purchased the estate in 1937. Hollywood stars such as Marilyn Monroe, Clark Gable, Charlie Chaplin and Greta Garbo vacationed at the castle whilst McIlhenny owned it. The Irish Gleann Bheatha (Bheithe) translates into English as "Glen of the Birch Trees".